Changning has made great strides in economic and social development over the past year, particularly in the fields of industrial transformation, environmental protection, urban renewal and public health. For Changningers, striving for a better future is everyone’s mission under the new leadership of the Communist Party of China, since the CPC Constitution was amended to include Xi Jinping Thought on Socialism with Chinese Characteristics for a New Era, as a new component of the Party’s guide for action. District officials, grassroots cadres, Party members, office workers and local residents are looking forward to a great time ahead since General Secretary Xi put forward his vision for a new era, new ideas, new paradigms and new goals. In line with his thesis, the principal paradox facing Chinese society is that it has evolved in the new era and become unbalanced and inadequate in addressing the people’s evergrowing needs. “People really need high quality air, water and greenery. We are doing our best to increase the green space and get rid of air pollution,” Wang Weiren, Party secretary of Changning District, said. “People’s pursuit of a better life is what we strive for,” Wang added. All of China has witnessed a comprehensive, open and fundamental change, since the 18th National Congress of the CPC in late 2012. But people’s demand for a better life has also changed amid social development in recent years, according to Wang. Previously, each community in Changning had one health service center. On the basis of that, an additional three or four hot spots for a healing service have been established in every community for the convenience of elderly people. Meanwhile, Changning is trying to improve the air quality by eliminating some of the factors that can cause air pollution. All coal-fired boilers within the district have been demolished, while oil-fired boilers will be phased out and replaced by natural-gas fueled ones. Changning authorities have also eradicated the black sludge flowing through the district. The major clean-up measures include dredging polluted rivers, removing floating pollutants and building separate sewerage and rainwater pipes, as well as demolishing illegal structures on riverbanks. At the same time, Changning is increasing more green spaces. Although land resources in downtown areas are limited, Changning taps as much of the potential as it can to build rooftop and vertical greeneries. Beyond that, a number of parks and greeneries are currently being constructed, with work expected to finish by the end of next year. The parks and greeneries will be connected through a nonmotorized slow traffic system and jointly form an ecological corridor to become a good interpretation of the harmonious co-existence between human and nature. 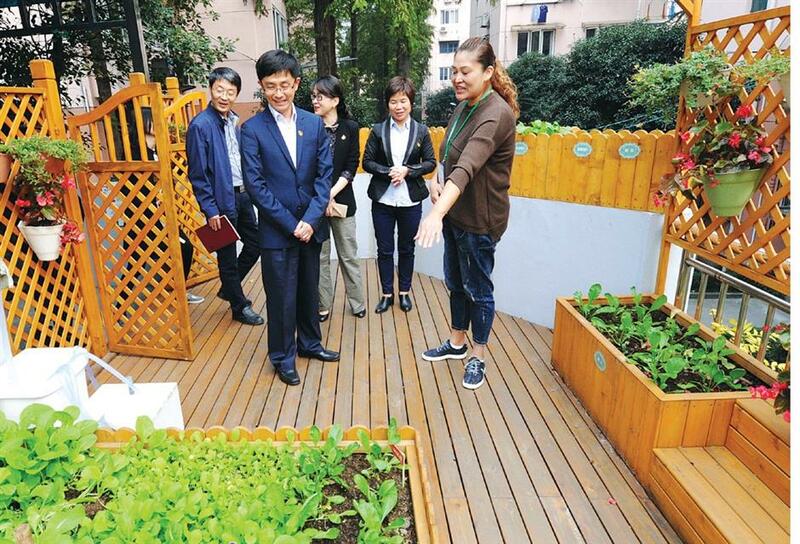 Changning District’s Party Secretary Wang Weiren (left, front) visits a green corner set up by the local residents in Aijian community. Wang said the district government will support all efforts to improve the local living environment. Changning is busy renovating all around the district. To the east of the Inner Ring Road, jobs mainly focus on the protection of historic blocks along Xinhua Road, Yuyuan Road and Hengshan-Fuxing roads. The district has around 250,000 square meters of old residential buildings where people still share kitchens and toilets. These buildings will be renovated for use by 2020, while some others are to be set aside for residents’ activity centers and public venues. The renovation project will also target more than 500,000 square meters of historic buildings within the district. Changning’s economic future will focus on aviation, Internet plus life service and fashion and creative industries. Hence, cadres in Changning are required to be quick learners and understand the operation of enterprises and the pattern of economic development so as to better fulfill their duties. As part of Changning’s institutional innovation, the downtown district has issued the city’s first batch of business licenses that allow companies, including those from abroad, to operate in multiple addresses across the city. Thanks to the “one license with more addresses” trial scheme, firms based in Changning, especially Internet startups, will be able to expand more rapidly. Meanwhile, residents will get easier access to more outlets and service stations of these companies near their communities. The “multiple addresses” under a single license include the companies’ delivery and reception stations, warehouses and after-sales service sites. Under the scheme, Changning-based companies with multiple outlets or branches do not need to apply for multiple licenses for each as is the case elsewhere in the city. Changning also spontaneously replicates and expands some policies initiated by the China (Shanghai) Pilot Free Trade Zone in line with its own industrial structure. The district is creating a business friendly environment, particularly focusing on the security and rule of law, to optimize government administration and services, according to Wang. “Changning has nearly 30 incubators at present. Around 80 percent of the startups from them later develop into enterprises and more than 70 percent of them start paying taxes very rapidly,” Wang said. Changning supports innovation and entrepreneurship with preferential policies, education and an atmosphere aimed at putting entrepreneurs on the right track. 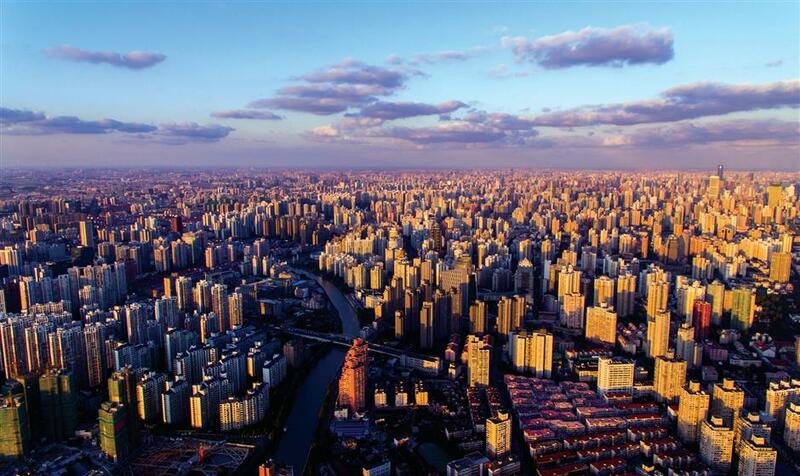 Communities, campuses and industrial parks have become three pillars of innovation and entrepreneurship in Changning, particularly as the district plans to create its own entrepreneurial ecosystem through joint development and communication. 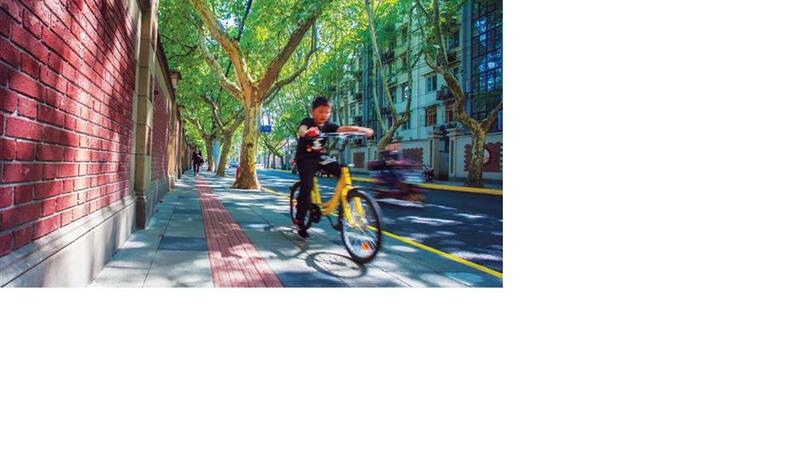 Yuyuan Road in Changning is renowned for being a neighborhood rich in culture and history.